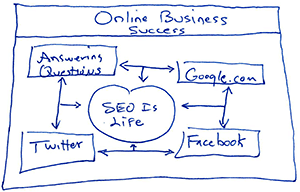 My personal slogan for online business building, “SEO Is Life” refers to the all encompassing power of Google.com and social media in regard to our future, and our success in life, and business. Search Engine Optimization (SEO) is involvement. Success online requires both passive and active involvement in promoting your brand. Business building on the other hand is all about dedication and relentless purpose driven behavior. Writing your goals down then executing them like your life depends on it is what separates the wannabe from the successful. Become your goal. Become your purpose. Accept your persona and revel in what you do. Of course a re-watch of Dr Joe Dispenza, Breaking the Habit of Being Yourself, wouldn’t hurt. And what does the Yoast WordPress SEO plugin have to do with life, the universe and everything online? Well, to start, in my humble opinion the Yoast WordPress SEO plugin is the best in its class; and is one of the easiest ways to establish your business persona online. Not being an uber SEO expert, I follow the advice of experts like Joost de Valk and his WordPress plugin. 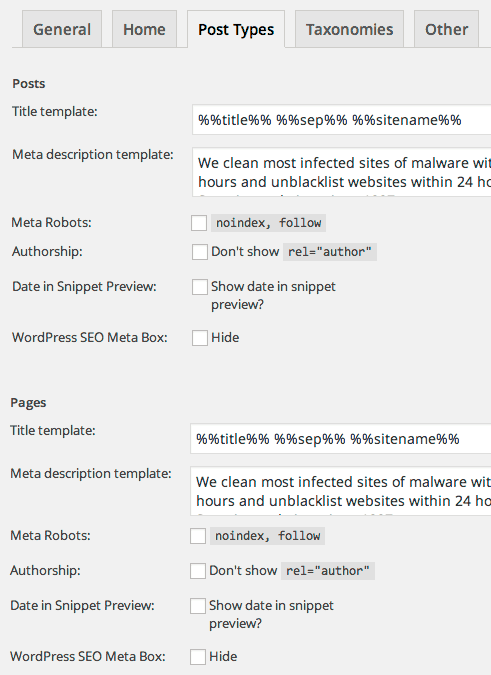 Below is a primer on how to get started in using the Yoast WordPress SEO plugin. 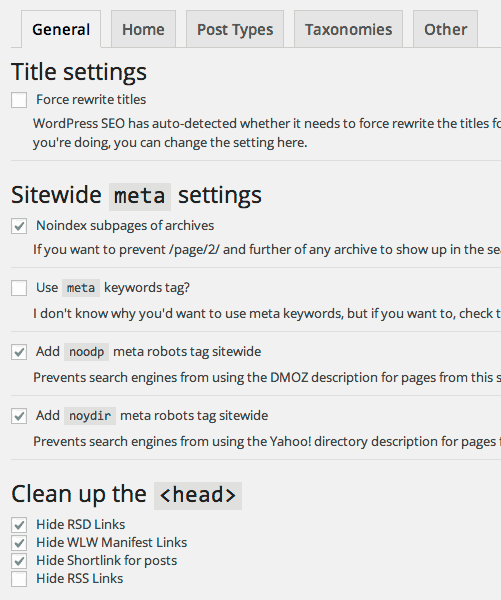 What are the best Yoast WordPress SEO Settings? Below are my recommended settings. If you have other settings you prefer I would love to hear them. Be sure to write your own page titles and descriptions after writing your article. The remaining options are fairly self explanatory, though be sure to write your own descriptions. 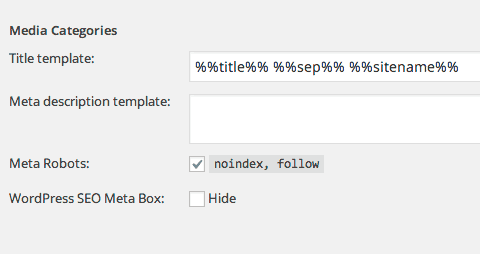 Now onto the secret sauce—The Yoast WordPress SEO “Social” tab. 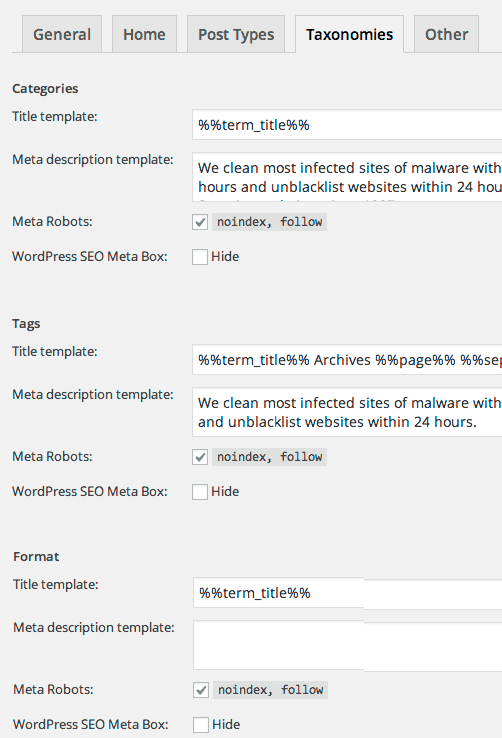 Completing the Yoast WordPress SEO: Social section is crazy important. Doing so adds important microdata to your posts and pages. For Facebook, the Facebook open graph tags will help define your content for sharing; pre-populating a share with picture, summary, and link back to your page. For Twitter, Twitter cards data is provided, so a visitor can more easily post content with a link back to your page. And the sweetest of all, is the Google+ feature. Add in your Google + page “About” URL, and you’ll be well ahead of most in regard to the relatively new Google Authorship and verification program, where verified authors are spotlighted with their picture in the Google Search results page. Can I get an OMG! And there it is. Enjoy! to contribute to this review. No monies were paid to write this article.